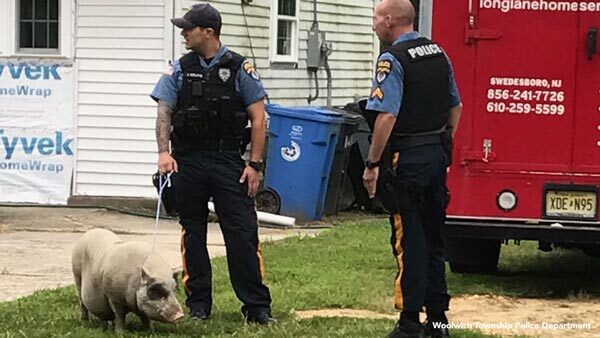 WOOLWICH TOWNSHIP, N.J. -- Police in New Jersey were put to the test over the weekend when they were called to catch a loose pig. Three Woolwich Township police officers responded to a call about a mischievous pig roaming a neighborhood Saturday morning. Police said three officers used a makeshift lasso and dog treats to lure the pet pig back into its owner's yard. In a self-deprecating Facebook post , the Woolwich Township Police Department quipped, "No pig(s) were hurt in the process." The department also invited commenters to make their best "pig/bacon/cop" jokes. The department's piggy post has received more than 700 likes and 70 comments. One commenter asked if the pig could become the station's new mascot. Several said the post made them want to move to the township. Another commenter wrote, "Way to bring home the bacon, fellas."